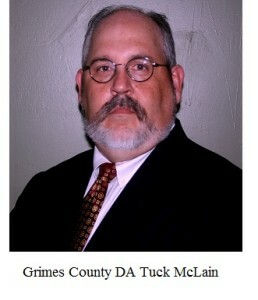 Some time this afternoon, grand jurors in Grimes County should receive copies of a letter requesting an investigation of District Attorney Tuck McLain. Since September, I’ve blogged about how the Montgomery County Auto Theft Task Force botched a raid on an auto auction last summer and how Mr. McLain and MCATTF cops have since tried to cover it up. In recent years, the Houston Chronicle and other media organizations have published stories about prosecutors who abuse their authority and railroad innocent defendants. Charles Sebesta, the former DA in Brenham and Caldwell, was disbarred last year on the grounds that he withheld exculpatory evidence and used false testimony to secure the capital murder conviction of Anthony Graves. In 2013, former judge and prosecutor Ken Anderson was jailed for contempt of court because he withheld evidence that would have proved that Michael Morton was innocent of murdering his wife. Mr. Morton served 25 years in prison before DNA evidence conclusively proved his innocents (and led to the capture of the actual murderer). I mention those cases because I am writing to request that you initiate a criminal investigation of Grimes County District Attorney Tuck McLain, as well as other officials in Grimes County and Montgomery County. I have enclosed a copy of a lawsuit (Exhibit 1) that I filed on behalf of Les Shipman against Mr. McLain and other officials in the U.S. District Court in Houston. I would direct your attention to paragraphs 18-27 and 30-33. As explained in paragraphs 30-33, Mr. McLain retaliated against my client and my co-counsel, John Quinn, after the federal lawsuit was filed. I have enclosed a copy of an affidavit (Exhibit 2) from Mr. Quinn. According to Texas Penal Code § 39.03(a), “[a] public servant acting under color of his office or employment commits an offense if he: (1) intentionally subjects another to mistreatment or to arrest, detention, search, seizure, dispossession, assessment, or lien that he knows is unlawful; [or] (2) intentionally denies or impedes another in the exercise or enjoyment of any right, privilege, power, or immunity, knowing his conduct is unlawful…” In other words, it is a crime to retaliate against my client or co-counsel for filing a lawsuit. My greater concern, however, is the ongoing effort to frame Mr. Shipman, Jerry Williams, and Israel Curtis with organized crime charges. As explained in the lawsuit, Lt. Joseph Sclider and other officers with the Montgomery County Auto Theft Task Force (“MCATTF”) conducted a televised raid on Mr. Shipman’s automobile repair business in Anderson. If they had conducted an investigation before the raid, they would have known that none of the vehicles at the automobile auction were stolen. Not one. Rather than admit his mistake in front of the television cameras, however, Lt. Sclider and his colleagues are desperately trying to cover that mistake. Mr. McLain has since recused himself from the criminal cases against Mr. Shipman, but I can tell you that one of his employees tried to see if Mr. Shipman would agree to a reduced misdemeanor charge to make the whole thing go away. In other words, Mr. McLain and his staff knew that they had no evidence to support the organized crime charge (a felony), but they were trying to negotiate a way to save face and get themselves out of the federal lawsuit. It’s too late for that, and Mr. Shipman has no intention of pleading guilty to a crime that he did not commit. Meanwhile, there is evidence that Lt. Sclider is still retaliating against Mr. Shipman. According to the affidavit of James W. Ross (Exhibit 3), Lt. Sclider has been telling Mr. Shipman’s customers that they do not need to make their outstanding auto payments because “the vehicles might have been stolen.” Others have stopped doing business with Mr. Shipman, claiming that they too were informed that Mr. Shipman was dealing in stolen cars. The allegations against Mr. Shipman are utterly and provably false, and Lt. Sclider and his cronies know that they are false, so why are people still being told that Mr. Shipman has sold stolen vehicles? I can only conclude that Lt. Sclider and his cronies are trying to shut down the federal lawsuit (and impair Mr. Shipman’s criminal defense) by financially crippling his business. If so, that’s a crime under both state and federal law. You may be wondering why I am writing directly to you, the members of the grand jury. By law, you have the right as grand jurors to initiate your own investigations, regardless of what the district attorney does or does not want you to investigate. “In consideration of the importance of the place occupied by the grand jury in our system of government, Texas courts have long described the grand jury as a separate tribunal, independent of the control of judges and prosecutors, whose proceedings are secret, vested with broad inquisitorial powers.” Whittington v. State, 680 S.W.2d 505, 512 (Tex.App. – Tyler 1984, pet. denied). Grand jurors may “act on their own knowledge and … [are] free to make their presentments or indictments on such information as they deem satisfactory,” Costello v. U.S., 350 U.S. 359, 361 (1956) (cited with approval in Whittington, 680 S.W.2d at 511). I urge you to ask Judge McKaig to appoint a special prosecutor to investigate Mr. McLain and the members of the MCATTF. The Thirteenth Court of Appeals has held that “[a] judge has the authority, as well as an obligation, to appoint an attorney pro tem to assist a grand jury that intends to criminally investigate the district attorney.” In re Guerra, 235 S.W.3d 392, 414 (Tex.App.–Corpus Christi 2007, orig. proceeding), disapproved on other grounds by In re Blevins, — S.W.3d —-, 2013 WL 5878910 (Tex. 2013). In other words, the grand jury has the right to assistance from a special prosecutor when it is investigating the district attorney. Finally, I encourage you to read the February 1, 2016 post on my blog (http://lawflog.com/?p=1027) about the sheriff directing auto repair business to a certain vendor. The grand jury may wish to conduct a broader investigation into the way business is done at the Grimes County Courthouse.